The character created in 1939, and on the popularity charters for so many years sure gets the attention of being a massive Slot Machine. 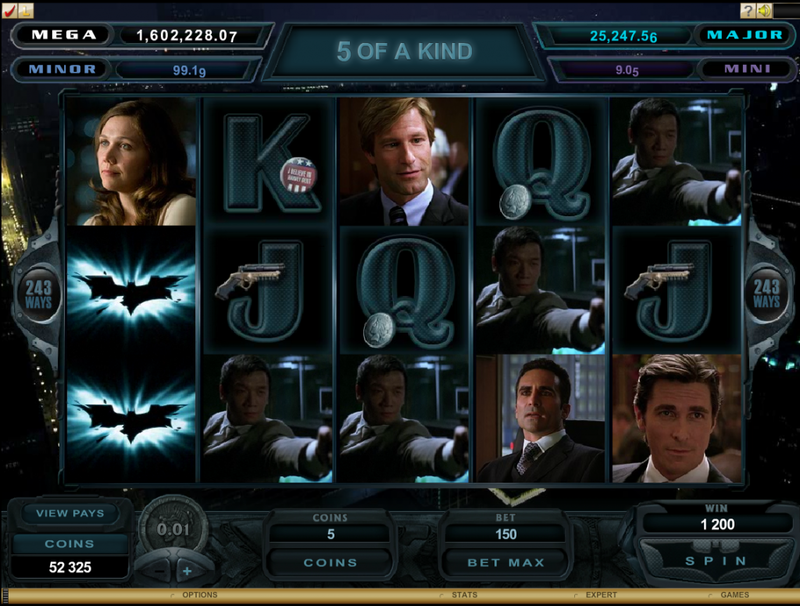 Batman Slots, based on the character created by DC Comics, is a massive 5–Reel 50-Payline Video Slots Game with an entertaining and adventurous Bonus Game. This Slots Game is developed by Cryptologic. Right from the beginning of the game, the player is drawn into the world of Batman. The game starts with a quick sequence of Batman chasing the Joker. It is a perfect set-up to a game of this stature. The theme and symbols of the game all represent the dark nature of Batman genre which is reflected in even the real comics and movies. The symbols are Batman, which acts as a Wild Symbol, Commissioner Gordon, Joker, the Bat Mobile, the Bat Bike, among others. The symbols have been given their own animations and some of them like the Wild Symbol comes with its own sounds. Also, the sounds during the Batman Re-Spins are quite distinctive. Apart from Re-Spins Spins, the game also has a Bonus Game referred to as Descent Into Madness Feature. Batman Symbol appears as a Wild Symbol, and can occur on any of the Reels 2,3 and 4. It can substitute all symbols except the Scatter Logo. The famous symbol of a Bat at night used in comics appears as a Scatter Symbol. The Scatter Symbol increases the chances of winnings. When the Bonus Bet is activated, 3 or more Scatter Symbols initiate the Descent Into Madness Feature. The Bonus Bet is activated while playing for 50 Lines plus extra 10 Coins. If playing on Bonus Bet, it increases the winnings considerably as it gives a chance of activating the Descent Into Madness Feature. Also, additional Batman Symbols are added to Reels 2,3 and 4 and the Scatter prize winnings are multiplied by 50 and bet per line. When Commisioner Gordon appears on Reel 1 and Batsignal appears on Reel 5 or vice-versa, the Batman Re-Spins Feature is activated. In this, one of the Reels 2,3 or 4 is expanded. All the free spin winnings are doubled and the feature can be re-triggered. The feature is activated during the Bonus Bet Stage with 3 or more Scattered Logos. The player gets to use the expert skills to target inmates with baterang to win prizes. Then the player needs to trap the Joker. If the Joker is trapped, upto 100 times the Triggering Bet is awarded. 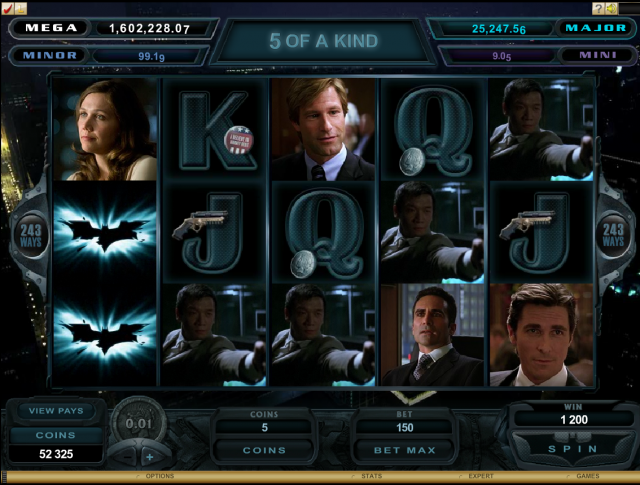 Intercasino featuring over 100 slots and the exclusive home of the Batman slot.